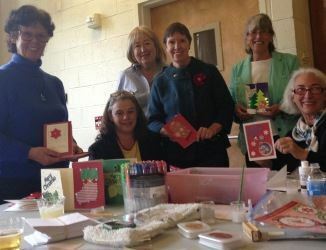 On a recent Wednesday afternoon Villagers got together for a “Holiday Card Workshop” led by members Jackie Durham and Bobbie Hertzfeldt. We were cutting out Santas and snowmen, making stunning greeting cards to share with clients at Miriam’s Kitchen. But it turns out that something else essential was happening, too. Over tables spread with glitter, ribbons, spiced cider and pumpkin bread, we shared laughter, life stories, let down our guard and got to know each other in a wholly satisfying way. Whenever Villagers gather, we continue to find we’re not just enjoying a stimulating, informative or fun program, but also forming new friendships and building a more cohesive community. According to research studies, we’re likely contributing to our longevity in the process. Examples of community-building from our first year of operation astonish me. Villagers who live in the same building yet never crossed paths have become friends. Rarely a day passes when I don’t run into a member or volunteer at the gym, in Trader Joe’s or waiting to cross the street. I moved to Washington four years ago, and making friends here was more difficult than I expected. I didn’t even realize I was lonely until I began volunteering with the Village. Through lunches, weekly meditations, chats at Coffee & Company, tours of cultural highlights, wellness workshops and film discussions, the impact of Village programs has enriched my well-being. No longer is Foggy Bottom West End the place I live – now it’s the neighborhood I call home. I am not alone in this, and the research studies are persuasive. Social isolation is a serious health issue. The influence of social relationships on the risk of mortality ranks as high as the risk factors for smoking, alcohol consumption, physical inactivity and obesity. By the end of 2014, FBWE Village will have hosted more than 200 programs representing nearly 2,000 volunteer hours of program planning and execution. Tax-deductible social memberships make up a third of our membership roster, and that number is growing. The Board of Directors puts a high priority on programs because a key part of our mission is to enhance the quality of life in Foggy Bottom/West End. Ensuring that Village Volunteers drive members to medical appointments and run errands is obviously vital. But what’s not so obvious is how important it is to help everyone in the Village live life to the fullest. Perhaps it has been a while since you’ve participated in a Village program. Please do plan to come and join us. Invitations to all programs are emailed about a month ahead. They’re listed in Bob’s Director’s Notes each week. We have a website program calendar. Signup is as easy as clicking a button or calling the Village office at 202-333-1327. Community is bound to happen. And you’re likely to live longer, too.